Conor Beresford is the current king of the UK rankings. Photo: PokerStars. As an online poker powerhouse country, the UK continues to be in the conversation of producing some of the best poker players in the world. Just as the country itself has been a major world influence in popular culture, players hailing from UK have helped shape the modern-day poker landscape including old school veterans like David ‘Devilfish’ Ulliott,Neil Channing and Roland de Wolfe, high-rolling regulars like Sam Trickettand Charlie Carrell and even some of the most recognizable faces of the game in PokerStars Team Pro Liv Boeree and online poker legend, Chris Moorman. 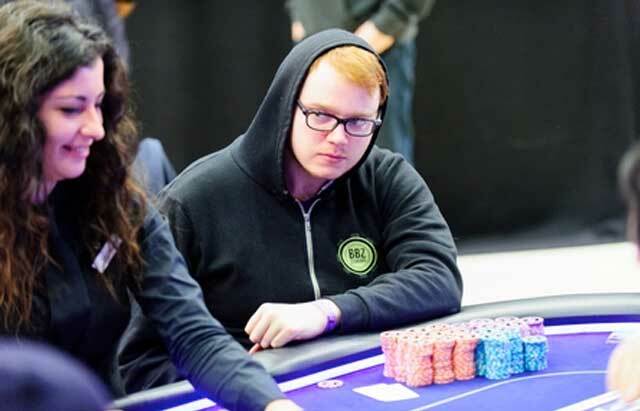 The current crop of Top 10 online players from the United Kingdom uphold the tradition of influential talented grinders and current at the top of the list is Conor ‘1_conor_b_1’ Beresford (6,76.34 PLB Points). Beresford is not only the #1-ranked player in the UK, but also currently sits as the #15-ranked player in the world, according to the PocketFives.com Worldwide Rankings. His last month is highlighted third-placed place finish in Event #8 of the PokerStars High Rollers Series ($2,100 8-Max No Limit Hold’em) where he took home $57,781. Beresford, constantly grinding a schedule of the largest online MTTs, cashed 30 times for four-figures or more in November and looks to out do that pace here in December already notching nine four-figure or more paydays including a sixth place finish in the PokerStars $1,050 Super Tuesday for $10,929. Despite Beresford’s amazing stats and consistency, he’s being hotly pursued by Team partypoker ambassador Patrick ‘pleno1’ Leonard (6,612.64). The former Worldwide #1-ranked superstar, currently sits as the UK’s #2-ranked player having just recently reached a new personal benchmark of eclipsing over $4 million in lifetime earnings. Leonard also did a good deal of damage in the PokerStars High Rollers Series cashing in five of the events for over $130,000. He final tabled three of the events and his largest score of the month came with his seventh place finish in Event #6 ($10,300 No Limit Hold’em – $1M Gtd) for $55,635. David ‘davaman’ Lopez (5,894.23) has ascended to the UK’s #3 spot. While there’s a pretty big gap between him and the duo of Beresford and Leonard, that could be in part due to a lighter play schedule in November. Originally from Spain, but currently playing out of London, Lopez reportedly at one point earned the title of Supernova Elite on PokerStars in only three months but with only a handful of scores for the month of November it looks like the pro is simply taking some time off after a month of everyday scores in October. Still sitting in the Worldwide Rankings at #40, his best recent score was a tenth place finish in the partypoker High Roller back on November 13 for $3,000. Literally right behind Lopez is the UK’s #4-ranked player Jonathan ‘proudflop’ Proudfoot (5,874.55). Proudfoot has been making waves in the Worldwide rankings, climbing just about every week in the month of November, where he currently resides at #41. Proudfoot has been putting in the time and his results have shown it. On the precipice of conquering $1 million in lifetime earnings, Proudfoot racked up 25 four-figure scores in November, not including his victory in the partypoker High Roller on November 28 for $19,734. Sitting less than 20 PLB points behind Lopez, he could, once again, climb the rankings in no time. Charlie ‘chaz_man_chaz’ Combes (5,843.76), caps off the UK’s Top 5, having recently taken down the partypoker High Roller on November 23 for $12,170. Combes is the third of the UK trio that occupies virtually the same space in the Worldwide rankings as he currently stands only 2 spots back from Proudfoot at #43 and as of now is trailing him only 30.79 PLB points, meaning things can change in a hurry on both the UK and Worldwide rankings list. Combes’ December is off to a hot start as well as the daily mid-high stakes tournament grinder has won nearly $40,000 in the first week of play. There’s a little breathing room between the #5 and #6 spots, where Owain ‘sngwonder’ Carey (5,581.54) ranks. Carey was recently featured in the PocketFives.com Milestones column for surpassing the $3 million lifetime earnings mark and he also is enjoying his highest placement in the Worldwide Top 100, currently sitting just outside the Top 50 at #51. Playing out of Glasgow as its #1 player, Ludovic ‘ludovi333’ Geilich-Jonsen (5,554.91) checks in at #7. After a light November schedule, Geilich-Jonsen emerged to cash in the PokerStars High Rollers Event #19 for over $7,800. PokerStars WCOOP Event #1 Champion‘carpediem200’ (5,426.14) checks in at #8. While still benefitting from the massive points boost a major victory like a WCOOP will give you, he’s not sitting idly by having put in a full schedule over the past two months raking in over 20 four-figure scores in that time period. Bristol’s Oscar ‘MendaLerenda’ Serradell (5,408.48), a former #2-ranked Worldwide professional, occupies the #9 spot. His victory in PokerStars Bounty Builder on November 14 for $7,297 was his highest PLB points score of November and is basically the difference between him and the #10 spot which belongs to…Chris ‘moorman1’ Moorman (5,278.54). As we previously mentioned, Moorman is one of the UK’s most popular and accomplished tournament grinders. The 888poker ambassador recently published his second book as well as took down one of the side events at the World Poker Tour Five Diamond (Event #9 $1,100 No Limit Hold’em Turbo) for $37,132. Even with all of his media duties and live play, he still finds the time to grind and add to his over $14 million in lifetime earnings. His most recent only victory came just days after his live win as he took down the PokerStars Bigger $162 for over $5,200.